Christian Women Affiliate LLC is now Owned and Operated by Heather Randall. I am blessed to say that I will always be the Founder of this amazing ministry. I know that in the hands that God has placed it, it will grow into everything God wants it to be. Heather worked with me the past 7 months and it is my honor that she takes the torch to lead Christian Women Affiliate and all of it's Divisions into the next season. Below is what was listed on this page before, and how you can still connect with me. It has been a blessing and an honor to work with every single person that came through my path here at CWA. Get your Voice heard and your Audience reached. Custom Web Design and Consulting. Membership Site for all clients with Tutorials to help you on the journey. My focus is very one on one and custom to your Vision. Need Vision? Creative Consulting is for you. In 2007 you could have never convinced me I would be doing what I am doing today. Yet I am thrilled to be here! I am a visionary and love to build from the ground up. I have implemented this in my life since I was just a young teen. Be it doing a total redesign of any room in our house before mom got back or doing the same for a Daycare I worked in. Showing the owners how much more efficient and inviting 'my' set up was compared to theirs. Yes, that was back at 16. That attitude got me out on my own at 18 and then on the road singing professionally by the time I was 19 after making a 'cubicle recording' & mailing it in to a booking agent in Orlando. Next thing I knew, literally 3 days later, I was fronting a 7 piece Dance band across the country in Top of the Circuit Clubs and 6 week repetitive stays at a time in Bally's Casino Atlantic City. By the age of 22 I knew without a doubt that God had wanted me out of that scene and back home. I got myself back into church, and quickly met my husband. It's been 22 years now. I kept singing, but in the church leading worship. I never had the peace to return to the stage in other way. That was me, but my daughter has recently stepped right into my shoes on that stage. Starting with being Broadway bound and then Leading Praise & Worship, she is now pursuing her own music full time here in Nashville where her and I reside in what we call, the Nash Pad. You can read my full 'Linkedin' profile for all that Bio Breakdown. Christian Women Affiliate LLC was birthed in my spirit on New Years Eve 2009. I bought the domain that night. It was a huge vision that to this day the ideas for it run wildly in my head. It has been a journey. I have had amazing support. My stash of dark chocolate and iced Jasmine Green Tea sweetened only with Nu-Stevia has been an absolute constant. As most know me online to say, just Hit Me if you would like to know more or would like to connect. 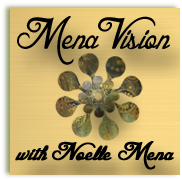 You can find me all over the web as Noelle Mena, and all of my links are above.